Norway placed first and second in today’s World Cup 6 x 1.6-kilometer classic team sprint in Lahti, Finland. Skiing for Norway I were overall winners Emil Iversen and Johannes Høsflot Klæbo. They won the ten team final in a time of 18:57.19 minutes. In a photo finish for second place, Sindre Bjørnestad Skar and Eirik Brandsdal of Norway II finished 0.65 seconds back to take the second podium step. Iivo Niskanen and Ristomatti Hakola of Finland placed third (+0.71). On the way to the win, Norway I won their semi-final with of a time of 19:22.32, 0.63 seconds ahead of Germany. Norway II, on the other hand, came in third in their heat to first place Russia I and second spot Finland I. The finals were marked by several teams vying for the lead. In six lap race, with each athlete skiing three 1.6 k legs, the team sprint favors those with endurance and traditional flat-out World Cup speed. At times, the Swedes, the Italians, and Russians all made plays for the lead. None were able to make any advance stick or discourage Norway I.
Norway II, the second overall team on the day, held a more conservative approach in the final. Coming into the start of the third lap, they were positioned in eighth. They began to surge toward the front during the race’s second half, moving into fourth after 4.8 k. During the final two laps, they maintained their position near the front. At the 17:40 minute point of the race, as Klæbo stamped his aerobic mark on the race with a surge on the final climb, Norway II tried to match the tempo, but sat in fourth. At the hairpin turn atop the climb, where skiers began their long descent into the stadium, it was two team race for second with Klæbo meters ahead. 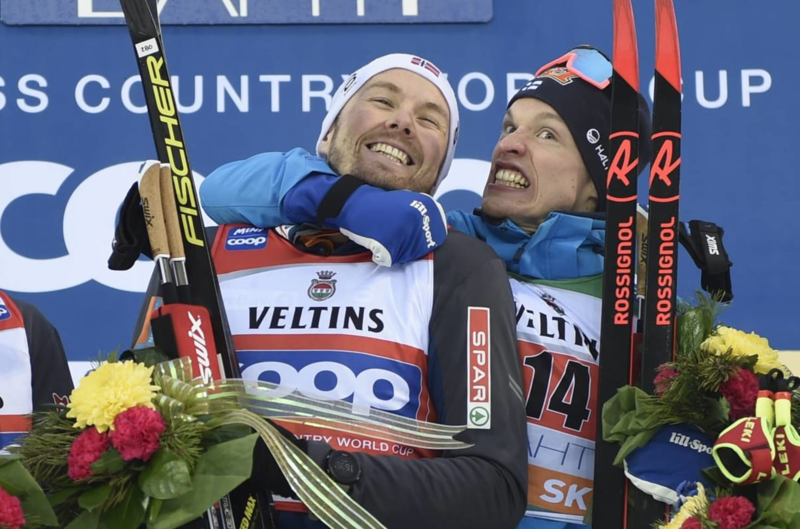 Finland I, in second as the skiers descended, skied a tactfully sound and uptempo race. Niskanen was the smart-choice Finnish anchor as he raced the fastest lap time of the race (3:16.04 minutes) during his last lap. Finland came into the finish with what looked like a lock for second. 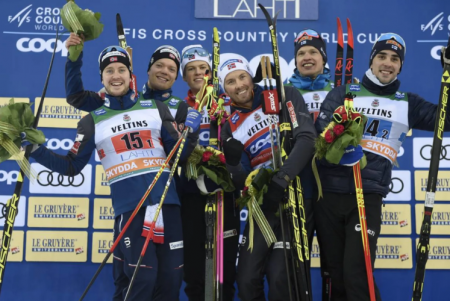 But Norway II’s Brandsdal put on a sprint finish double pole clinic topped with a perfect out stretched toe and lunge at the line to take the second spot ahead of Finland I.
Kevin Bolger and Logan Hanneman skied for USA II. USA II placed sixth and USA I was right behind, placing seventh in the semi-final. Neither team advanced to the finals. On his final lap, Bolger skied the fastest lap time of his cohorts in a mark of 3:09.0 minutes. Hamilton also touched base with FasterSkier after the race, via email. Hamilton took the month of January to focus on training and hasn’t raced a World Cup since January 1st. The World Cup will be move to Cogne, Italy next weekend before heading to Seefeld, Austria for World Championships.